We often see some food packets with “Halal” and “Kosher” printed on them. Some of us know that these are dietary restrictions for the Islamic and Jewish people, but there are people who do not know the difference between the two. Can Muslims consume food that is Kosher? Can Jewish people eat Halal foods? This article will discuss the difference between the two. Halal means “permissible” or “lawful” by the Islamic law. Any food with the “Halal” seal means it was prepared according to Islam’s religious rituals and methods. Halal allows any edible saltwater or freshwater creatures like lobsters, fish, crabs, shrimp, etc. to be consumed by Muslims. Chevon, mutton, beef, and chicken meat can be eaten; however, pork is strictly prohibited. When it comes to slaughtering livestock and poultry, Allah’s name should be said before each slaughter for the meat to be considered Halal. The blood should also be drained from the body of the dead animal because animal blood should never be consumed. Additionally, any animal parts or organs may be cooked and eaten as long as the preparation is in accordance with the religious methods. Moreover, any food or recipe that contains added alcohol is not forbidden in Islam. In preparing food, the kitchen utensils should also be Halal. This means that the kitchen items should not be used to prepare non-Halal food. For the utensils to be considered Halal, they should be completely sanitized according to Islamic law. Kosher is any food that is prepared in compliance with the Jewish dietary laws. Freshwater and saltwater creatures may be eaten as long as these animals have both scales and fins. Therefore, crabs, lobsters, shrimps, and seashells are forbidden by Jewish laws. Meat from land animals may be eaten except for pork or any other meat that comes from animals that do not have cloven hooves. Certain types of fat and the sciatic nerve are unfit for consumption. The hindquarters of an animal can be eaten as long as they underwent a porging process (a method of removing blood vessels). Animal blood is not fit for consumption. In fact, it should be drained from the animal in order for the meat to be Kosher. Additionally, in order for the meat to be considered Kosher, a prayer should be recited before slaughtering the animals and the slaughter itself should be uninterrupted. The slaughter should be quick and painless. Dairy is permissible in Jewish law. However, it is important to note that dairy and meat should not be put together in one dish. Any food that contains both dairy and meat is not Kosher. Jewish law allows the consumption of alcohol as long as it contains all Kosher ingredients. However, the law requires grape wine and grape juice to be prepared in accordance with the religious methods. The kitchen utensils used to prepare Kosher food should also be Kosher. This means that the utensils used to prepare meat products should not be used to prepare dairy products. This is why some conservative Jews do not eat at restaurants that do not follow this rule. 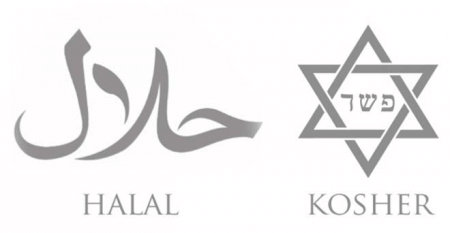 What, then, is the difference between Halal and Kosher? The greatest difference between the two is that Halal is the dietary law for Islamic people whereas Kosher is the dietary law for Jewish people. Halal allows the consumption of any edible aquatic animals. However, Kosher forbids the consumption of any aquatic animal that does not have both scales and fins. Halal does not permit the consumption of alcohol or any food that contains alcohol. Kosher law allows the consumption of alcohol as long as it is made from Kosher ingredients, and grape wine and grape juice should be prepared according to religious methods. Both Halal and Kosher allow meat and dairy, but Kosher specifically prohibits combining both. Eating pork is prohibited by both laws. In order for meat to be considered Halal, however, the name of Allah should be said before slaughtering each animal. Blood is unfit for consumption according to both laws, but the Jewish law prohibits the consumption of the sciatic nerve and some types of animal fat. Furthermore, the Jewish law also requires that the animal must die a painless and quick death and that blood must be completely drained from the body of the animal by hanging the animal or by processing the meat with salt. Halal requires that the kitchen utensils used to prepare Halal food should not be used to prepare non-Halal food. If they are used to prepare non-Halal food, however, they can be used again as long as they are completely sanitized according to its laws. For the Jewish people, kitchen utensils that have been used to prepare both meat and dairy are considered unclean and should never be used to prepare Kosher food again.